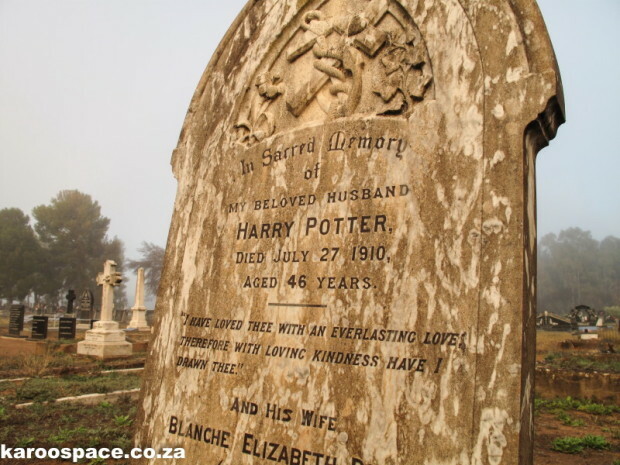 The grave of one Harry Potter in the main cemetery in Cradock. JK Rowling, creator of the billion-dollar boarding school fantasy series, is famous for putting her hero Harry Potter in harm’s way. But does she know that he has been lying in a Karoo grave for nearly a century? In a strange time warp of fate, Cradock in the Karoo Heartland might well hold the secret to Harry’s fate. 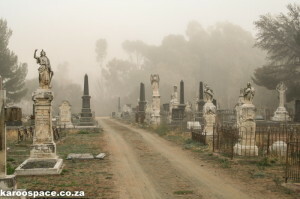 The river town – with its back to the spekboom thickets of the Eastern Cape and its front to the vastness of the Karoo plains – boasts a classic country cemetery which becomes a vampire movie set with the first swirl of morning mist. And somewhere in the midst of departed nuns, frontiersmen and soldiers who fell in the Anglo-Boer War, is the gravestone of none other than Harry Potter. All we know is that this Harry was a ‘beloved husband’ who died on July 27, 1910 at the age of 46. Cradock cemetery on a misty Karoo morning. In real historic terms – and also strangely ironic, bearing in mind that Cradock becomes something of a hotbox in high summer – one of the men who adventured with the legendary Scott of the Antarctic also lies buried nearby. Dr Reginald Koettlitz (1869–1916) was Scott’s Chief Medical Officer (and occasional botanist) on an earlier Antarctic trip. He had also worked in Abyssinia, Somaliland and Brazil before buying a medical practice in Somerset East and then eventually moving with his wife to Cradock for health reasons. He died of dysentery on January 10, 1916. Two hours later his wife died – of a heart disease. Extract from Karoo Keepsakes I: A Traveller’s Companion to the Heartland of South Africa, by Chris Marais and Julienne du Toit (MLM Publishers, 2009). 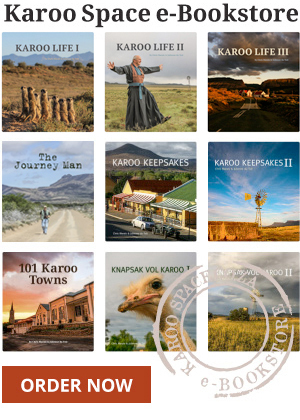 Order the Karoo Keepsakes set in print form HERE. All set up for Ebook reading? Have a look at this GREAT OFFER! The Michau clan holds a get together Sat 2nd to Sun 3rd at Victoria Manor. We explore the family tree. trim it ,add to its foliage and taste its fruits! Also a visit to historic family farms and the cemetery.